Mad City Labs offers a module that converts the RM21™ platform into a total internal reflection fluorescence (TIRF) microscope. The TIRF module makes the transition between epifluorescence, TIRF, and HILO (Highly Inclined and Laminated Optical) microscopy techniques effortless. The TIRF module is a precision aligned add-on component to the RM21™. The TIRF module controls the angle of illumination and the focusing of the excitation beam onto the back focal plane of the objective lens. 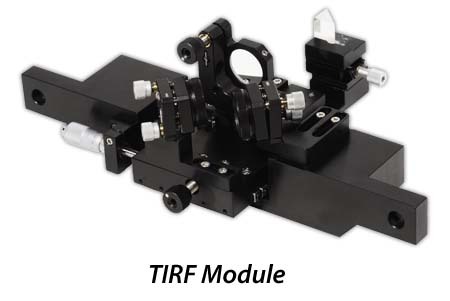 The TIRF module enables straightforward adjustment of the excitation beam from along the optical axis for standard epi-illumination of the sample to TIR illumination of the sample, and any angle in between. The figures below illustrate the use of the TIRF module in epi-illumination and TIR illumination. The excitation beam is reflected from M1, which is attached to a kinematic mount for fine direction control. M1 is fixed and does not translate. The excitation beam reflects from M2, which can be translated along the beam path using a micrometer. M2 is also attached to a kinematic mount for fine control of the beam. L1 focuses the excitation beam onto the back focal plane of the objective lens. L1 can be adjusted by the kinematic mount and translated axially using a micrometer. The beam translation (shown in the Detailed view of TIRF Module, above) moves the location of the beam on the back focal plane of the objective for epi-illumination/TIR/HILO. M3 is the TIRF module's exit mirror and is used to direct the TIR exit beam to the TIRF Lock™ module. 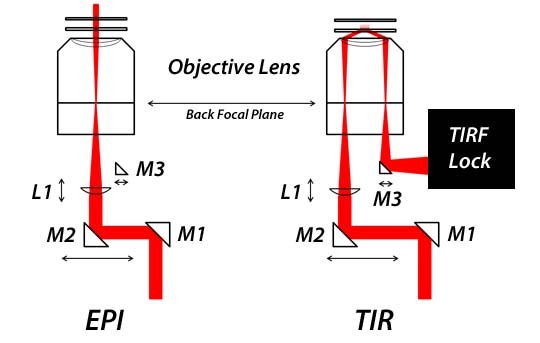 TIRF Lock™ keeps the sample in the focal plane by maintaining a constant TIRF signal. TIRF Lock™ measures the displacement of the exiting TIR beam and is used with a Z axis sample nanopositioner to keep the sample in focus. The TIRF module is capable of controlling the full range of sample illumination angles from EPI to TIR. In practice, the sample illumination angle is adjusted for each experiment to provide the optimized signal-to-noise (SNR) for the available fluorescent signal. In some experiments, optimal SNR is achieved using HILO illumination, which brings the excitation light in at an angle very close to the critical angle. The excitation beam thus enters the sample by refraction, but does so at a sharp angle and can achieve better SNR by limiting the excitation of out of focus probes. HILO is one specialized example of the techniques that can be done using the TIRF module for RM21™.